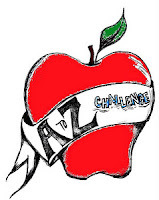 Being Retro: A to Z Blogger Challenge 2012 is Coming! Big News for 2012 in the April "A to Z Blogger Challenge" is coming and guess what they let me join the team, yes your friendly neighborhood zombie-man is somebody. Now I was always somebody, but this challenge was huge last year... this year is going to be bigger. So click the apple or this link: "A TO Z BLOGGER CHALLENGE" to find out more... you know you want to join and these aren't the droids you are looking for. I hope you all can join us this year as we plan to take the blog world by "S"torm, so more "D"etails will be coming. For now click the "A"pple above and be part of the fun. Sign ups for the Blogging from A to Z April Challenge will begin on January 30, 2012. I'm looking forward to co-hosting with you and the team! I had so much fun last April, with the A to Z Challenge, I can hardly wait for this one to start! I am really looking forward to the Challenge this year. Congrats on being a host. You all make a most excellent team. Not too sure what you have to do? hi retro-zombie, I'm looking forward with great anticipation to this year's edition of the A-Z challenge. Last year was brilliant for me and my blog! Glad you're with us as a co-host, Jeremy. Going to rock the house this year! You are going to add a real creative touch to this year's Challenge. Glad you're with us. Anyone who likes the Three Stooges and Barney Fife is a freind of mine! Looking forward to the Challenge. Not sure what to expect except that it will be a lot of fun. Awesome!!!! Can't wait to see your part! And you've always been somebody to us!!!!! I wandered over here from Stephen's blog, and am gonna take his advise and sign up as your newest follower. Holy mackerel! Digital designer, huh? You have one of the coolest looking sites I've ever visited. Hope to join y'all in the challenge this year. Fun post! Stephen said to drop by and follow. Er, I did. I'm on the fence about A-Z, but just maybe this year. I'm no Zombie expert, but I'm liking your blog! Glad to be co-hosting with you! The banner you made is great! Looking forward to working with you. Awesome post! I look forward to co-hosting with you! hi there! Making my rounds to the co-hosts I don't know to say hi and wish you the best! Great to meet you! I am so looking forward to the challenge this year...got your name from the A-Z Challenge site and the minute I clicked on this page and saw Don Knotts I knew it would not be a waste of time! You must be so busy with all of these activities..great to meet you! thank you all for stopping over, been some great comments from you all. i sure hope that i can provide some extra fun in this year... as many might have guessed i am not that normal... a zombie with a heart and soul, just lacking braaaaaiiiiinnns. sorry i had to do it, i really am a zombie for retro things or new stuff with a modern stuff with a vintage feel. It was a blast last year, will be moreso this year hosting with you! Yay!